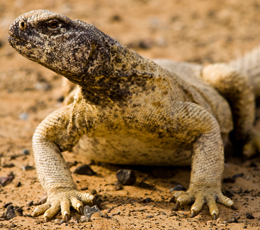 Leptien's spiny-tailed lizard (Uromastyx aegyptia leptieni), endemic to the UAE and Oman, are large herbivorous lizards found on gravel terrain and inter-dune compact soils. They can grow up to 75cm long and usually live in loose colonies. As Spiny-tailed lizards are part of the herbivore community in the DDCR and were directly affected by low vegetation density and off-road driving in the past, it was decided that a baseline survey of their numbers, distribution and density needed to be conducted. The survey was conducted during October 2008 and May 2009 and focused on the burrows of the Spiny-tailed lizards. Transects across the gravel plains were surveyed and burrows were classified into three categories (Active, Inactive & Abandoned) according to the presence or absence of activity. The survey was divided into two areas the Al Maha Reserve AMR and the rest of the DDCR. The results showed a healthy population of lizards in the DDCR with 448 active burrows and a further 48 inactive. A high number of abandoned burrows (740) were also found and has been attributed to both relocation and predation. As expected, the majority of the DDCR population (48%) were found within the AMR where the population density was much higher as result of a more suitable habitat due to longer protection from overgrazing and off-road driving. The results from this survey form a good base for the continued monitoring the Spiny-tailed lizard population as well as a platform for more detailed studies of the species in the DDCR.